More than four months after it was unveiled at the 2015 CES, the price and release date of Parrot’s Bluetooth-enabled, self-watering planter are still a closely-guarded company secret. But the French drone maker had better hurry because a serious challenger has already cropped up. 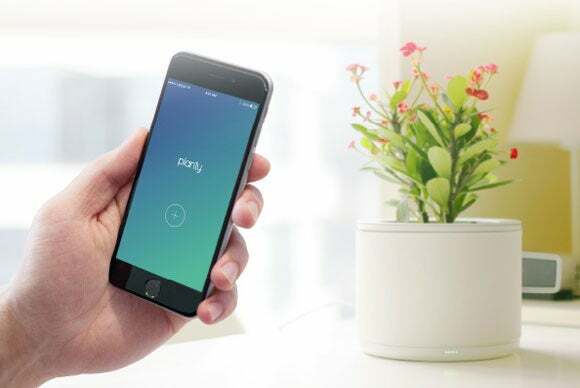 South Korean startup Nthing recently wrapped up a successful Kickstarter campaign for a smart pot called Planty. While the whole thing was a bit of a roller coaster, the firm ended up absorbing a little more than $100,000 worth of financial nourishment—and plenty of crowdfunding spotlight. Planty uses its various onboard sensors—soil humidity, temperature and light—to monitor the water level and surrounding conditions, promptly relaying the data gleaned thus straight to your smartphone via the Planty app. It alerts you whenever your plant is too dry, needs light, or requires an adjustment in the ambient temperature. The smart pot connects to the Internet using Wi-Fi and draws power over USB. And as for that much-touted one-touch remote watering feature, it has a 500ml (17 fl. oz.) reservoir that hugs the actual plant container like a belt. It can also interface with connected-home devices such as the Nest Learning Thermostat and Philips Hue smart bulbs to ensure the temperature and lighting in its immediate vicinity are to your plant’s liking. After an initial flourish, the funds almost completely dried out. Things got worse when a backer who had pledged $10,000 withdrew with less than three days to go, leaving the campaign well short of its funding goal. It was a nail-biting finish in the end, but Nthing somehow dragged itself across the finish line. According to the latest campaign update, things are proceeding as planned and the first Planty units should reach backers in November. Why this matters: The promise of being able to monitor and water your plants remotely should appeal to a large section of gardeners, whatever be the proverbial color of their thumbs. For the green-thumbed, it could be a great remote gardening solution for when they are away and (fully) trusting lesser mortals with their plants is not an option. For gardening greenhorns, timely alerts and ready access to plant health data could be just what they need to stop killing plants.